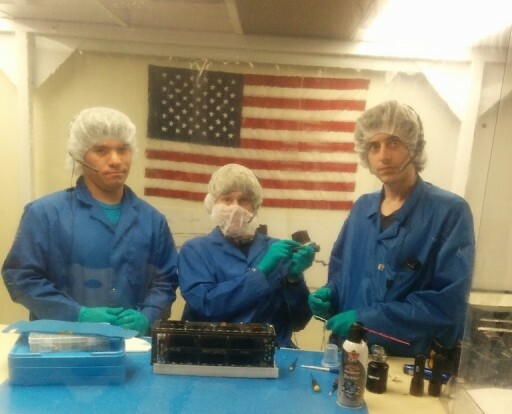 ExoCube (CP-10) is a 3-Unit CubeSat developed by the California Polytechnic State University, equipped with an in-situ space weather platform that will measure a number of atomic and ionic substances in the exosphere providing data on the abundance of individual species as well as total ion density. Knowledge of the composition and the current state of activity in the exosphere can be useful in the prediction of space weather phenomena in order to forecast potential effects on satellite communications (including GPS navigation) and spacecraft performance. Additionally, measurements of atmospheric density can provide data to satellite operators on the speed of orbital decay their satellites are subjected to over the course of a cycle of solar activity. Making use of the 3U form factor, ExoCube combines standard CubeSat features such as power-generation and satellite control/data handling with unique features driven by the requirements of the scientific payload. 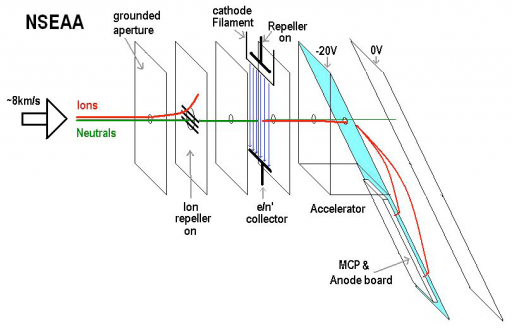 ExoCube employs body-mounted solar cells to deliver power to a battery unit and dedicated electronics that condition the main power bus of the satellite as well as secondary voltages for the various subsystems of the satellite while also controlling the state of charge of the batteries. One of the characteristic features of ExoCube is an environmental chamber that is purged with sulfur hexafluoride to ensure the satellite instruments remain in a controlled environment prior to launch. A series of umbrella valves and silicone o-ring gaskets ensure that the pressure is vented from the chamber in a controlled fashion once a certain pressure differential is reached during ascent. In space, the instruments are exposed by dedicated doors. The Attitude Determination and Control System of ExoCube combines a passive gravity-gradient stabilization system with an active attitude control system in order to keep body rates under 0.1 degrees per second, maintain a nadir pointing attitude within +/-10 degrees and keep its ram-facing side pointing toward the direction of travel with a +/-5-degree accuracy. Two deployable booms with brass masses at their tips are deployed on the long axis of the satellite to provide gravity-gradient stabilization that will keep the satellite orientation stable on two axes with a pointing stability of +/-10 degrees. A three-axis magneto-torquer system is used for refinements of the satellite attitude. Three Magnetic Torque Rods are used to create angular momentum by running a current through coils in the presence of Earth’s magnetic field. The torquers are regulated by computers that control the current that is passing through the coils in order to control the force generated on each axis. Additionally, ExoCube hosts a single Sinclair Momentum Wheel with a momentum of 10mNm that couples yaw and roll control for gyroscopic stability. The Momentum Wheel keeps the pitch axis very stable and runs at a constant speed throughout the mission. Attitude determination is accomplished by a three-axis magnetometer, a gyroscope unit and sun sensors on all side panels of the spacecraft and one of the booms. Two 3-megapixel cameras with 25° field of view are installed on each z-panel of the satellite to provide a visual confirmation of boom deployment and spacecraft attitude. Satellite communications are done via the amateur 437MHz UHF band using a ground station in San Luis Obispo that has satellite passes every eight orbits which is sufficient for clock and TLE synchronization. 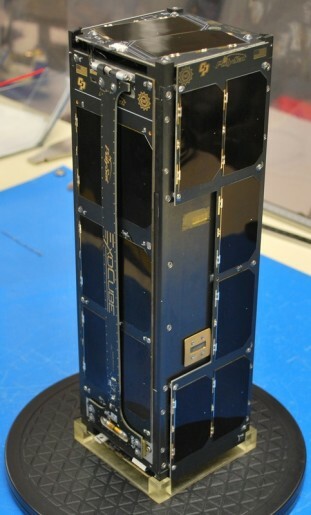 The scientific payload of ExoCube consists of a miniature time of flight mass spectrometer and ion sensor built at NASA’s Goddard Spaceflight Center. The instruments installed on the satellite are named Neutral Static Energy Angle Analyzer (NSEAA), the Ion Static Energy Analyzer (ISEAA), and the Total Ion Monitor (TIM). The individual analyzers use electrostatic accelerators and Multi-Channel Plate detectors with the differences in between the instruments being ion, neutral or no repeller systems. Data interpretation and data product generation is done by a science team with participation of The University of Wisconsin – Madison, the University of Illinois at Urbana–Champaign and Scientific Solutions, Inc. The primary objective of ExoCube is the in-situ measurement of the following species within the Earth’s tenuous exosphere: [O], [H], [He], [N2], [O+], [H+], [He+], [NO+]. Operating for an extended period of time, ExoCube will reveal spatial and temporal variability of the abundance of these species including diurnal and seasonal variability. The satellite will study charge exchange processes, and atmospheric response to geomagnetic storms. Data will be used to improve atmospheric models. ExoCube is the first craft to make in-situ measurements of Hydrogen in this particular exospheric region and the first to keep tabs on Oxygen and Helium since measurements made in the early 1980s. The mission is cooperating with different Earth-based observatories that measure atmospheric composition at the given altitudes which will help in the validation of ground-based observations and lead to potential improvements for data retrieval algorithms from interferometric and photometric measurements. ExoCube will operate for at least six months to be able to observe one complete exospheric cycle from equinox to solstice.